Figure 31.2. Kaplan-Meier survival curves for 100 HL patients. (A) event free survival and (B) overall survival. Hazard ratios are unadjusted Cox models and Cox models adjusted for International Prognostic Score. (Reproduced with permission from the American Journal of Hematology and John Wiley and Sons). Figure 31.3. Response to lenalidomide therapy in a case of Hodgkin lymphoma. 18F-FDG-PET imaging at (A) baseline and (B) after the 3rd course of therapy. (C) Changes in sFLC levels during therapy. (Reproduced with permission from the American Journal of Hematology and John Wiley and Sons). The tumour cells of HL (Reed-Sternberg cells) derive from germinal centre B-cells that have lost the expression of most B-cell specific genes, including those for immunoglobulin proteins . These cells account for only approximately 1% of cells in the tumour tissue. The remaining tumour bulk consists of non-malignant reactive cells, including B- and T-cells, plasma cells, eosinophils, neutrophils and mast cells. These non-malignant cells are recruited and/or induced to proliferate by the tumour cells . In turn, they provide survival/proliferation signals to the tumour. Since the Reed-Sternberg cells do not produce immunoglobulins, they would not be expected to produce FLCs . However, B-cells account for between 2 and 50% of the infiltrating cells in HL lesions, and are likely to be a source of FLCs in HL tissue . In fact, approximately 30% of newly diagnosed HL patients have an elevated κ and/or λ sFLC concentration at diagnosis . The majority of HL patients have polyclonal sFLCs, with an abnormal κ/λ sFLC ratio present in only 5 - 7% of cases . De Filippi et al. studied the prognostic value of κ + λ sFLCs (ΣFLC) in a cohort of 248 untreated HL patients. Receiver operating characteristic (ROC) analysis defined 57.1 mg/L as the best threshold with which to discriminate outcomes. The proportion of patients achieving a complete response (CR) was significantly higher in those with ΣFLC <57.1 mg/L than in those with ΣFLC >57.1 mg/L (96% vs. 67% respectively; p<0.0001). In a multivariate model, only ΣFLC and positron emission tomography (PET) imaging remained independent predictors of outcome. The outcome for patients with both risk factors (elevated ΣFLC concentrations and PET positivity) was significantly worse than for those with one or neither of these factors (8-year EFS: <10% versus 36% or 93%; p<0.0001). Pinto et al. observed a statistically significant difference in κ and λ sFLC concentrations in newly diagnosed or relapsed patients compared with patients in complete remission. This suggests that sFLC measurements may have use in monitoring HL. In support of this, increased concentrations of sFLCs were associated with a lenalidomide-induced HL tumour flare reaction . This is discussed in the case study below. A case of Hodgkin lymphoma tumour flare reaction monitored with sFLCs. A 22-year-old male with biopsy-proven refractory HL (stage IVB) was one of three initial patients enrolled into a program of lenalidomide therapy . At baseline, 18F-FDG-PET imaging demonstrated widespread lesions in nodal and extranodal (lungs, sternal ribs) site (Figure 31.3A). His spleen was enlarged with multiple nodulations. He had thrombocytopaenia, anaemia, and suffered from cough, exertion dyspnoea and persistent fever requiring methylprednisone. The patient received 3 cycles of lenalidomide. Five days after starting the second course, the patient developed an acute inflammatory reaction characterised by the painful swelling of left inguinal lymph nodes and chest bone pain (exacerbated by finger pressure and breathing). A Grade 3 tumour flare reaction was diagnosed and the lenalidomide dose was reduced from 25 to 15 mg/day. Following the third course of lenalidomide (at 15 mg/day), the patient achieved a partial remission. This was associated with a reduction in the number and size of tumour lesions at all disease sites (Figure 31.3B), and a stable recovery of platelets and haemoglobin. sFLCs were measured at baseline and during therapy. 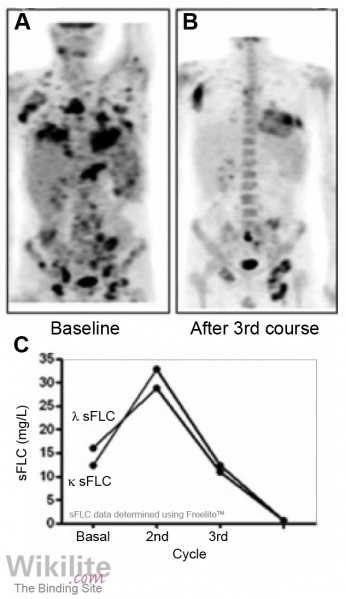 Following lenalidomide therapy, sFLC concentrations increased, which is consistent with the observed tumour flare reaction. One month after the third course of lenalidomide sFLCs were markedly reduced, consistent with the response to treatment (Figure 31.3C). Tumour flare reactions were observed in a further two patients in this study . In all three cases, flares were associated with the transient elevation of sFLC concentrations with a normal κ/λ sFLC ratio. Such findings are consistent with lenalidomide-induced activation of polyclonal B-cells within the tumour tissue. With continuing treatment, polyclonal sFLC concentrations decreased to normal concentrations.